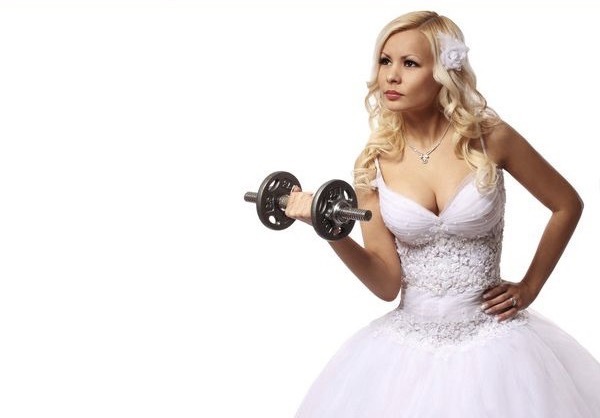 Fitness Guide For Lazy Brides! Many brides-to-be try quick fixes to drop the pounds quickly. Some of those methods may work a bit but often times they fail miserably. That’s because quick fixes, diet pills, and extreme crash diet plans don’t usually deliver, it’s better to make smart, reasonable and sustainable changes to your current diet and fitness plan.we love you just the way you are! But if you have a fitness goal you would like to achieve before your wedding day, than try this workout plan. The program is made up of two-week cycles by Rachel Torgerson! 20 minutes of aerobic activity (running, walking, jogging, cycling—anything that gets your blood pumping) at least 3 times a week. If you’re not the running type there are plenty of moves (try burpees, jumping jacks and mountain climbers), classes or exercise videos out there that will also get your heart rate going (Zumba, anyone?). Want to boost your burn? Add an extra day of activity to your week or switch a resting day to a weightlifting day. 30 minutes of aerobic activity at least 3 times a week. * For any exercise throughout that has multiple sets, you should rest 1–2 minutes between completing each set. *As always, consult your doctor before starting any exercise or nutrition regimen. *Try not to focus on quick results—you don’t want to get discouraged early on or you’ll never stick to the program. This is about creating a healthy change in your lifestyle that will show up with time.